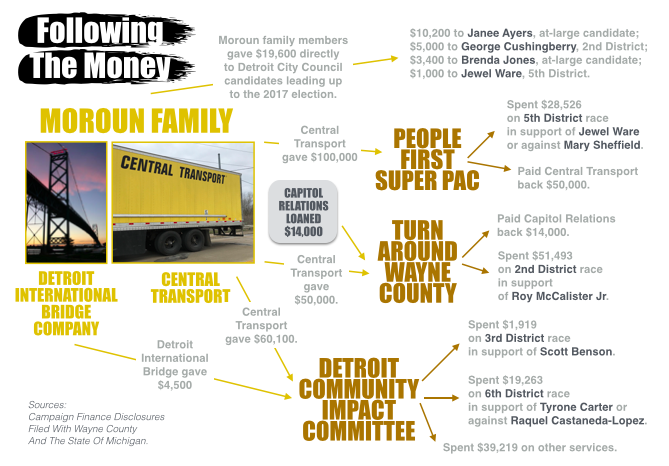 Through Direct Contributions and Three Super PACs, the Moroun Family And Its Connected Businesses Spent More Than Anyone Else On Council Races In Michigan’s Largest City. DETROIT (JUNE 27, 2018) — Businesses tied to a single family injected more money than anyone else into races for the Detroit City Council last year. But before the election, the family’s efforts were clouded by a web of Super PACs and disclosure loopholes. 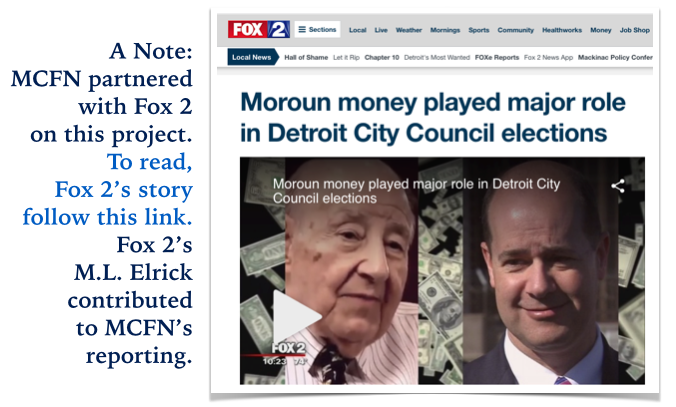 A new joint investigation by Fox 2 Detroit and the Michigan Campaign Finance Network found that members of the powerful Moroun family and companies run by the family combined to spend about $184,200 across races for nine seats on the Detroit council in 2017. The spending total was more than double what any other group shelled out for the council races. However, a Detroit voter wouldn’t have been able to determine that fact until Jan. 31, 2018, nearly three months after the election. Companies connected to the family bankrolled three different Super PACs that worked to influence council races. Because of loopholes in Michigan’s disclosure requirements, the PACs didn’t have to report the full breadth of their involvement in the races until the end of January. In one case, a lobbying firm loaned a Super PAC money before Election Day. The Super PAC spent more money than it had on hand trying to sway a council race, according to its filings. Then, after Election Day, a Moroun company contributed $50,000 to the Super PAC. The money covered the Super PAC’s spending and also paid back the lobbying firm. The Super PAC, called Turn Around Wayne County, didn’t report the $50,000 contribution on a disclosure until Jan. 24, 2018, 78 days after the election the PAC worked to influence. “Who they supported was targeted,” Casteneda-Lopez alleged, saying the PACs went after council members who opposed the family’s wishes on specific issues. The family’s patriarch is Matty Moroun. He’s the force behind the trucking-company Central Transport and of the Ambassador Bridge, which is the bridge crossing from Detroit to Windsor, Ontario. As for the timing of the Super PACs’ public disclosures, the spokesperson directed questions to the individual Super PACs or the Michigan Secretary of State, which regulates campaign fundraising. The disclosures do appear to follow the law. Dan Stamper, president of the Moroun family’s Detroit International Bridge Company, which operates the Ambassador Bridge, said the family doesn’t manage the PACs they financially support. ”Once we write a check, that's in the committee's hands,” he said. To Roy McCalister, it seemed like every time he turned on the computer, social media ads supporting his campaign for a seat on the Detroit City Council were there. But those ads weren’t coming from McCalister’s campaign. McCalister, a former police officer, and former state Sen. Virgil Smith were in a race last fall for the 2nd District seat on the Detroit City Council. McCalister’s campaign raised about $65,828 with much of it coming from his own pocket. Smith’s campaign raised about $35,350. But another group called Turn Around Wayne County got involved in the race. 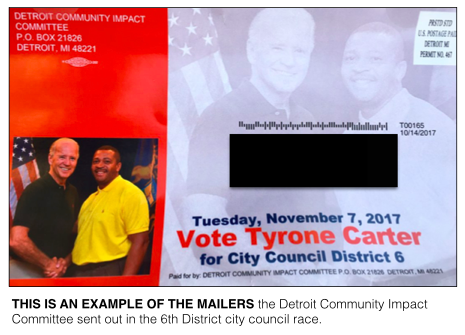 The Super PAC, which had supported Wayne County Executive Warren Evans in a past election, reported spending $20,000 on social media ads supporting McCalister and $31,493 on mailings supporting McCalister. The true source of the mailers and ads backing McCalister wasn’t made known until January 2018. Under the state’s campaign finance laws, the Super PAC’s activities through Oct. 20 had to be disclosed on Oct. 25, weeks before the election. 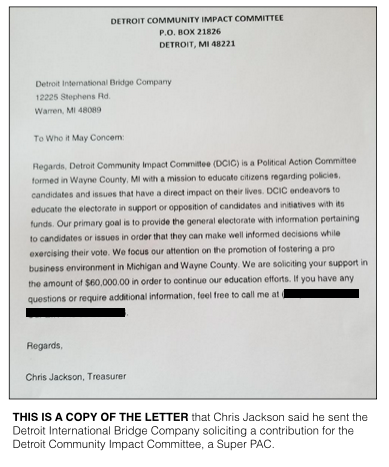 In that pre-election filing, Turn Around Wayne County reported receiving a $14,000 loan from Capitol Relations, a lobbying and consulting firm based in Farmington Hills. At that time, it reported spending $20,000 on social media ads supporting McCalister. Then, in its January 2018 filing, the Super PAC revealed that it had spent $31,493 on Election Day to support McCalister. That means the Super PAC’s balance on Election Day would have been in the negative, according to campaign finance disclosures. Later, according to the January filing, Central Transport gave $50,000 to the Super PAC on Dec. 8, 2017, a month after the election. The money covered the Super PAC’s apparent debt, and the Super PAC used a portion of it to pay Capitol Relations back its $14,000 loan. Capitol Relations’ founder is Michael Garavaglia, a registered lobbyist in Michigan and the chairman of the Wayne Airport Authority Board, Garavaglia declined to answer in-person questions about his firm’s involvement in the Super PAC. Instead, he directed questions to John Truscott, who owns a Lansing-based public relations business. Asked if the timing of the loan from Capitol Relations and the post-election contribution from Central Transport were an attempt to conceal Central Transport’s involvement in the race until after Election Day, Truscott said they weren’t. He added that all of the transactions were publicly disclosed as the law required. Truscott said Turn Around Wayne County asked for a contribution from Garavaglia, and Garavaglia made one. Garavaglia hoped his loan would be paid back, Truscott said, but he wasn’t sure it would be. Turn Around Wayne County may not have been the only Super PAC involving Garavaglia and Central Transport. Another Super PAC called People First used $50,000 from Central Transport to try to sway the city council race in the 5th District. There, incumbent Mary Sheffield faced a challenge from Jewel Ware, a Wayne County commissioner. People First, which formed in September 2017, disclosed spending $28,526 on research and mailings supporting Ware and opposing Sheffield. The Super PAC reported its spending happened on the day before the Nov. 7, 2017, election and the day of the election, so that spending didn’t have to be disclosed publicly until Jan. 31, 2018. Contacted for this story, People First’s treasurer, Carmen Gomez, referred questions about the Super PAC to Garavaglia. Gomez said she was simply the bookkeeper for the Super PAC. "It was basically just me and him doing everything,” Gomez said. She added, “Mike would have all the answers." Despite the outside spending, Sheffield, who raised $151,750 for her own campaign, won re-election with 63 percent of the vote. As for McCalister, he won the 2nd District seat with 59 percent of the vote. In Michigan, Super PACs can receive unlimited contributions from corporations but they can’t coordinate directly with candidates they’re supporting. McCalister said he’s never met Garavaglia or members of the Moroun family. But now, he said he’s worried about what could happen if the Morouns begin to view him as a foe. On top of Turn Around Wayne County and People First, there’s the Detroit Community Impact Committee. That Super PAC, which played in two other council races, received $60,100 from Central Transport and $4,500 from the Morouns’ Detroit International Bridge Company. Chris Jackson, a Detroit-based political consultant, led the Detroit Community Impact Committee, which formed on Oct. 10, 2017, less than a month before the election. “We had some interests that coincided as (it) relates to this past election and supporting pro-business candidates,” Jackson said in an interview. The Super PAC went on to spend a total of $60,402, including shelling out $19,263 on mailers and brochures against Castaneda-Lopez, the incumbent in the 6th District, and supporting her opponent Tyrone Carter. It also spent $1,919 on brochures supporting Scott Benson, the incumbent council member in the 3rd District. Detroit Community Impact Committee filed its first disclosure with Wayne County on Oct. 27, before the Nov. 7 election. The disclosure covered through Oct. 22 and included $60,100 in contributions from Central Transport and $5,795 in spending in the Castaneda-Lopez race. But the Super PAC didn’t have to file a disclosure covering its activities in the final days before the election until Dec. 7 2017. That disclosure after the election included the bulk of its spending in the Castaneda-Lopez race and the spending in support of Benson. Castaneda-Lopez narrowly won her race in the 6th District with 52 percent of the vote. Benson won with 63 percent of the vote. Russ Bellant, who ran against Benson, and others suggested that Morouns were targeting council candidates who supported more aggressive requirements for so-called community benefits agreements. These are agreements that set hiring and negotiation standards for developers that want to work on large projects in the city. Castaneda-Lopez mentioned that she was one of two council members who opposed a 2015 deal through which the city sold the bridge company land that could be used for a second bridge span to Canada. At that time, according to the radio station WDET, Castaneda-Lopez said the city shouldn’t settle for “crumbs” and the bridge company can’t be trusted. Through the Super PACs, the Morouns and their companies injected about $164,600 into the city council races. But family members also made about $19,600 in direct contributions to council candidates. The family’s total spending on the races was about $184,200. Across all of the council races in 2017, Fox 2 and MCFN tracked about $1.69 million in total spending. So the Morouns’ efforts accounted for about $1 out of every $9 in the Detroit council races. The Moroun family’s about $184,200 involvement in the city council races was more than the next three largest spenders shelled out combined, according to the tracking. 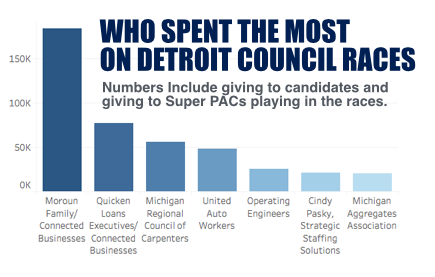 Employees of Quicken Loans and of connected businesses combined to spend about $77,375 on the council races. The Michigan Regional Council of Carpenters spent about $56,000. And the United Auto Workers about $48,500.